Experience the Ultimate in Beachfront Luxury on your own White-Sand Crescent Shaped Beach at Stunning Wailua Bay, Ideally Centrally Located on the Magical Royal Coconut Coast…Just Minutes from Towering Waterfalls and the Famous Fern Grotto. 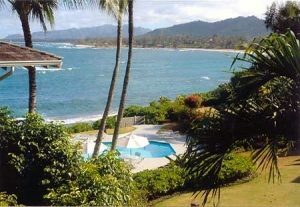 In a Private & Intimate Setting, The Oceanfront Views are simply incredible, as you Listen to the Sound of the Gentle Surf from the Spacious Private Lanai of your Luxuriously appointed 1-Bedroom or 2-Bedroom Designer-Decorated Kauai Condo Rental. 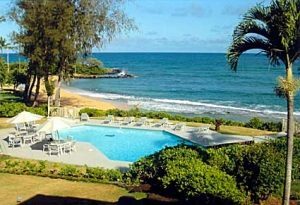 In a Private & Intimate Setting, the Oceanfront Views are simply Incredible, as you Listen to the Sound of the Gentle Surf from the Spacious Private Lanai of your Luxuriously Appointed 1-Bedroom or 2-Bedroom Designer-Decorated Kauai Condo Rental. 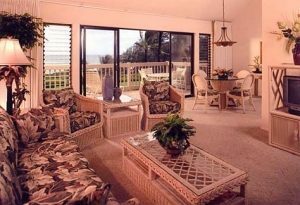 Relax in Comfort & Style from your Beautifully Appointed Kauai Condo . . . Enjoying another Spectacular Sunset as you sip your Favorite tropical Drink and the Gentle Tradewinds Caress your Senses . . . with the Aqua-marine Blue Pacific Right Outside your Door! The Oceanfront Views of your Kauai Vacation Condo Getaway are Breathtaking. You’ll Savor the Private & Intimate Ambience Framed by Swaying Coco Palms, with additional Appointments that Feature Fully-Equipped Kitchens, Oceanfront Master Bedroom Suites (most units), Double-Sized Lanais, Color-Cable TV & VCR’s. For your Added Vacation Pleasure, take a Refreshing Dip in our Stunning Oceanfront Heated Pool, Stroll our Lush Tropical Grounds, Enjoy Swimming & Snorkeling in the Crystal-Clear Waters of the Emerald-Blue Pacific . . . or Simply lounge Beachside as you soak up the warm Tropical Sunshine. At days end, prepare your Favorite Meal on our Gas BBQ’S, then take a stroll along the Beach enjoying another Spectacular Sunset! A Variety of Shops & Restaurants & Island Entertainment are Just Moments Away. Pamper yourself in Beachfront Luxury in a Magnificent Oceanfront Private Setting at Stunning Wailua Bay . . . Ideally Centrally Located on the Magical Royal Coconut Coast with Towering Waterfalls & Swaying Coco Palms . 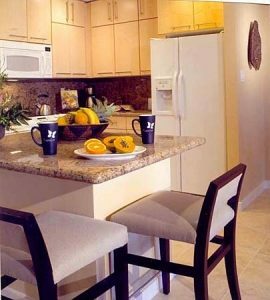 . . From the Privacy of your own Luxurious Condo at the Stunning Lanikai Resort. 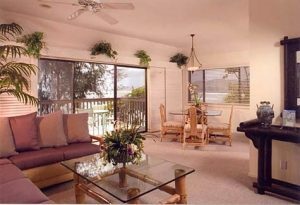 Your Luxurious Beachfront Kauai Vacation Condo Tropical Paradise Getaway Features your Choice of Spacious 1-Bedroom Kauai Condo Rentals that Accommodate 4 Guests; Or Roomy 2-Bedroom/2-Bath Kauai Condos – Many featuring Oceanfront Master Bedroom Suites – that Comfortably Sleeps 6. All Linens & Towels Provided.